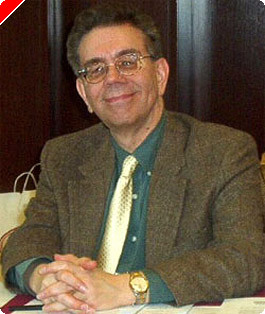 This article originally appeared on Pokernews.com, January 5, 2007. 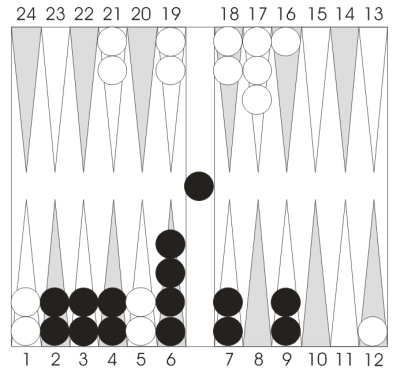 One of the most dangerous positions in backgammon is that of the out-timed and rapidly deteriorating position. Take a look at Position 1. These stretched positions usually arise when one side (Black below) has built a great front position quickly, but at the cost of leaving one or more stragglers disconnected from the main force. Most players in this situation assume that they must have done something wrong to get here. Perhaps they built an inner board point when they should have run, or brought down a builder instead of making an anchor. Sometimes that's true, but often these positions just happen. Black may have correctly pursued an all-out attack, and White just happened to anchor at the last minute. No need for recriminationsthe point is, what to do next? To save these crumbling positions, you have to make the most of your assets. In this case, you have two assets: you're ahead in the race by a ton, and right now your board is stronger than White's. To use these assets, you've got to force a conclusion to the game (at least this phase of it) right now. Come up to the edge with bar/20, and make the only reasonable ace, 9/8. You can't punt with bar/24 and 9/4. That play isn't even safe, and you have to roll a four almost immediately just to get to the edge of White's prime. Could White crush you if he rolls a 4-3 next, pointing on you? Sure. But guess what? If you stay back and he rolls 4-3, you're crushed anyway. Don't guard against rolls that beat you no matter how you play. True, there's some delicious duplication involved hereWhite needs 4s and 3s to hit your new blots, the same numbers that hit on the 20-point. But that's just a bonus. You'd make this play even if there were no duplication involved, because you've got to get your back checker out immediately. There's no time left to pray for a good roll. 51 actually is a pretty good shot (6-1 or 6-2 would be much worse), so make the most of it and see who survives the next roll.